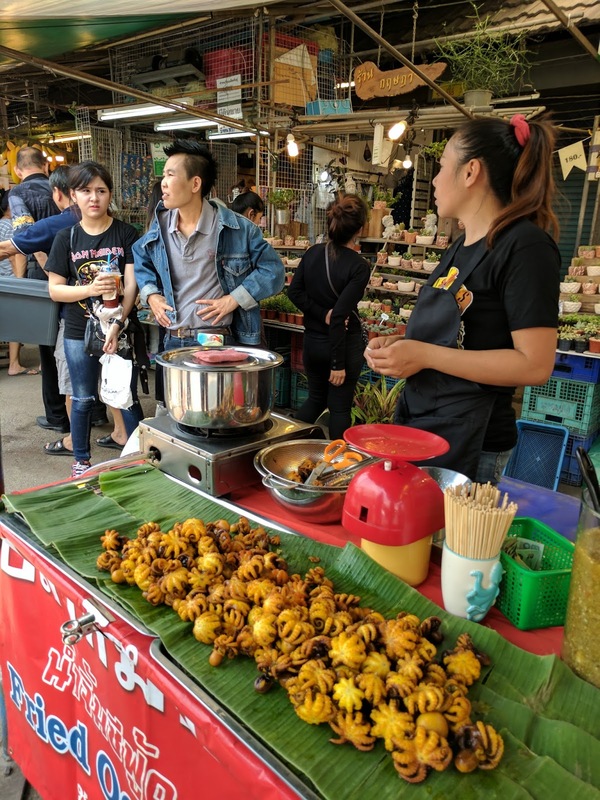 Eating street food in Southeast Asia seems to be one of the primary draws not just for Western travelers - with their steady diet of food, travel, and food travel TV shows - but for other Asian travelers as well. 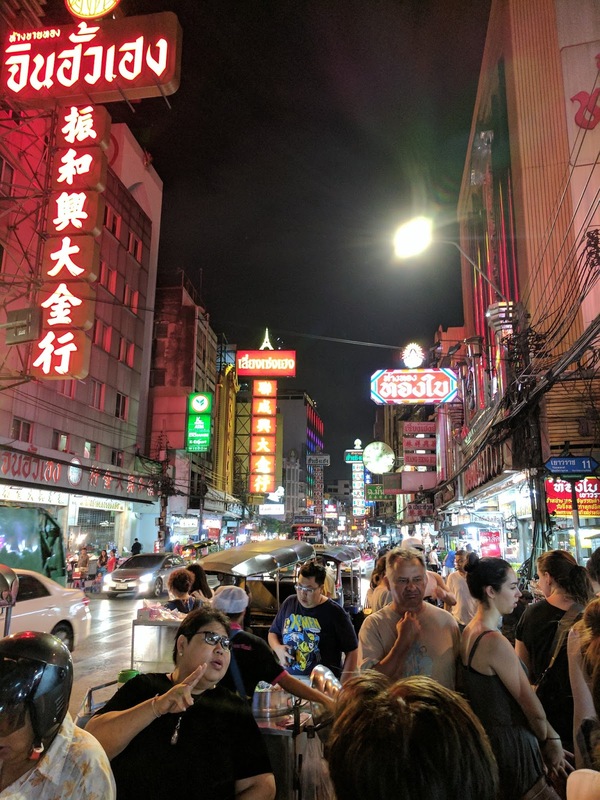 Being in the biggest city in food-crazed Thailand, we had any number of places to go for a sampling. 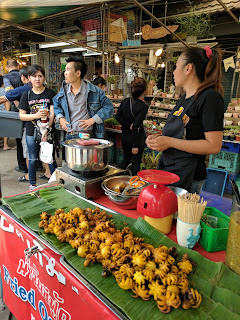 On Saturday we spent the better part of the day at the gigantic Chatachak Weekend Market, where there were quite a variety of food offerings, in addition to just about anything else you could possibly want to buy. We opted for lunch in a sit-down 'pop-up' place specializing in Tom Yam Kung, a spicy and sour soup served with giant prawns. The only cart food we tried was the tiny octopus, served in a plastic bag in spicy sauce, eaten with a skewer. The real street feast was not to begin until the following evening - Sunday. 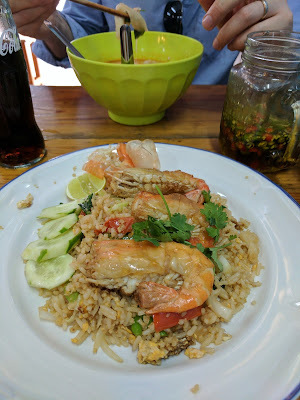 Sunday was the busiest day of our trip thus far (see post for Bangkok tourist "must-sees", the Grand Palace and Wat Phra Kaew compound, followed by a peek at the famous giant reclining Buddha at Wat Pho). 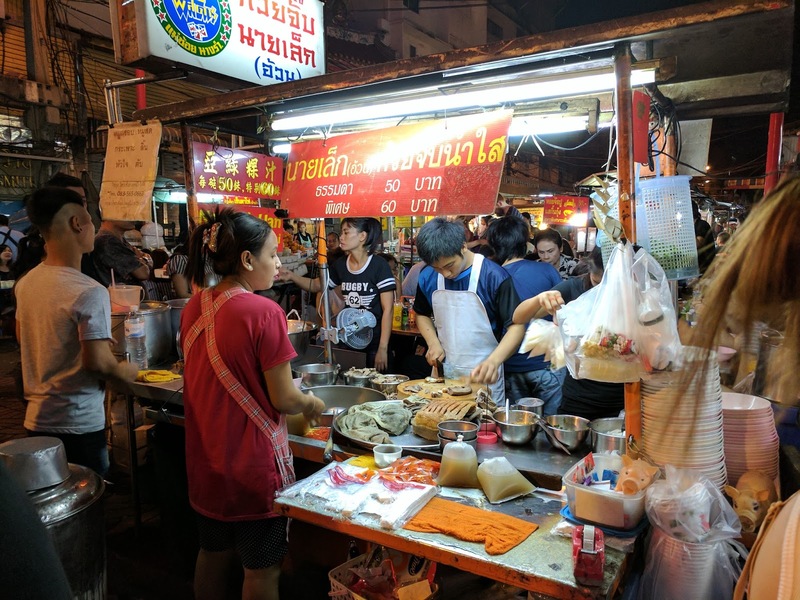 We had read in multiple sources that Chinatown, ironically, is one of the best places to get Thai street food in Bangkok. 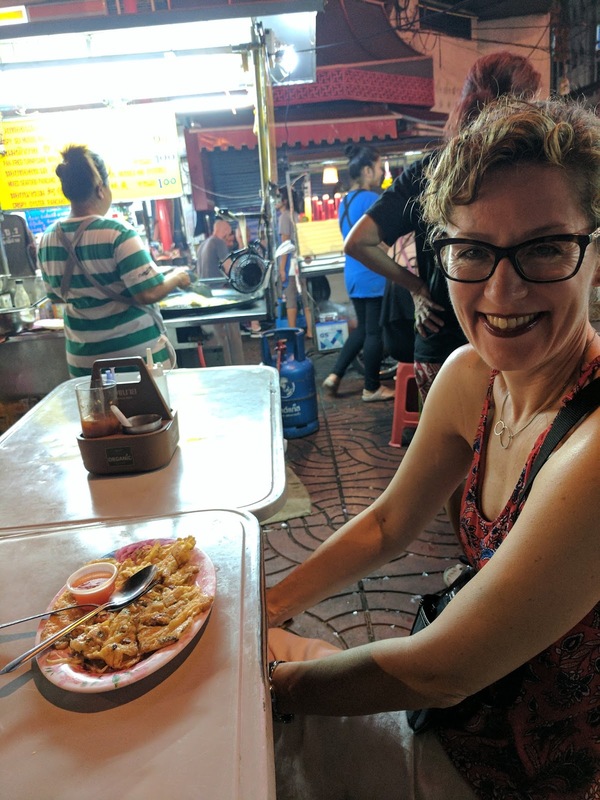 We had just enough energy remaining after our busy day of touring Bangkok's most famous wats for one last bit of excitement, so we hopped in a cab and made the 20-minute trek down to the heart of the Chinatown street food "scene". Our cab driver did not need to be told where to drop us off, as he knew very well the corner we should be visiting. We were far from the only ones with this idea. After a brief perusal of the various goods on the main drag, we decided to start with the less frenetic seafood pancake stand, where we shared a mussel pancake (more like an omelet than pancake). Served with a sweet and sour sauce, we both agreed that this was perfectly delicious. 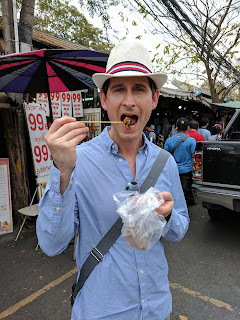 Next, Scott was really looking forward to sampling the guay jap (or kuay jap). 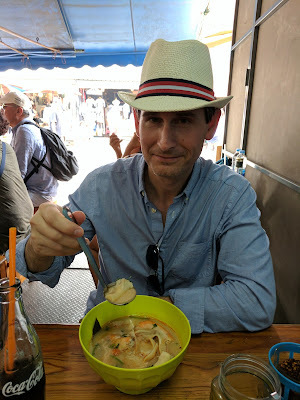 He'd read about this dish, and had also read that the best guay jap vendor was to be found right here in Chinatown. Seeing how this vendor had the longest line of any of the food stalls, that seemed to be a good sign. Guay jap is an intensely spicy broth with thick, chewy hollow rice noodle tubes, pork belly, and pork offal. We were eventually "seated" at one of the folding tables set up on the sidewalk, along with a young Asian couple that was also ordering some big plastic bags of the soup to go, in addition to their meal. The verdict? 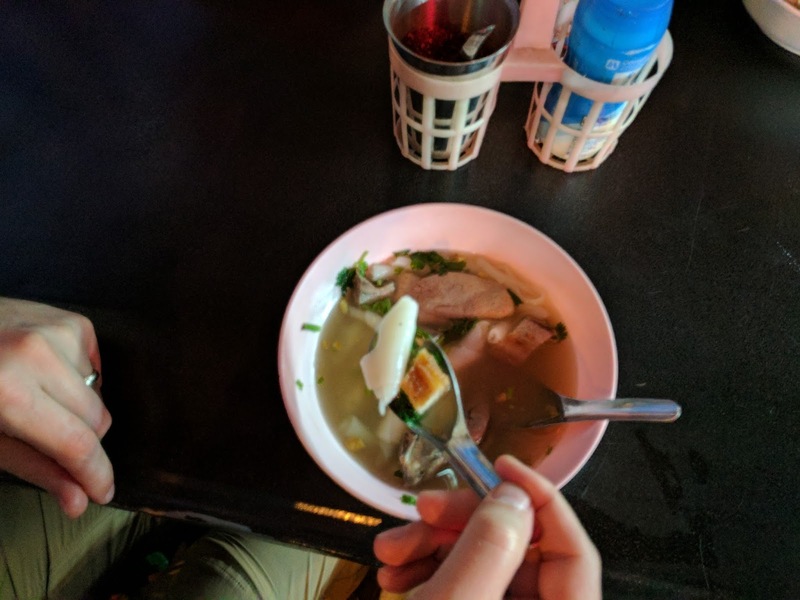 Scott thought it was the tastiest thing he'd eaten in Thailand to date, while Caroline found it to be too spicy to eat more than a single bite. 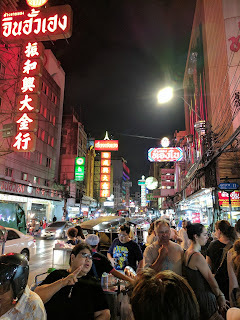 We proceeded to walk around Chinatown, away from the more popular section, down some quieter streets and alleys, looking for maybe one more snack before calling it a night. We eventually looped around and found a guy that we'd read about, selling only garlicky rice noodles with chicken and peanuts in an alley nearby where we started. Very tasty noodle dish, and much more to Caroline's liking, in fact one of her favorite dishes to date! 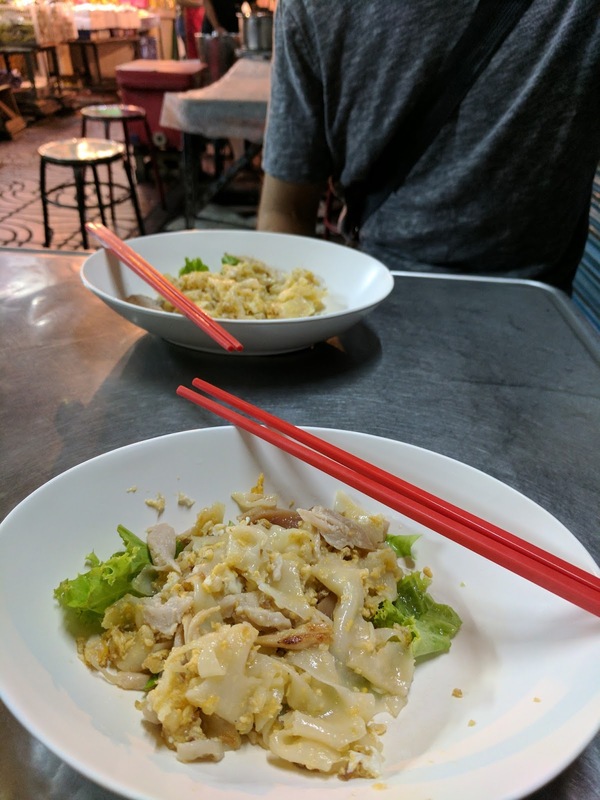 Noodles with chicken, garlic, peanuts, and even garnish! Sated, we decided we'd better walk back to the hotel, close to an hour away. 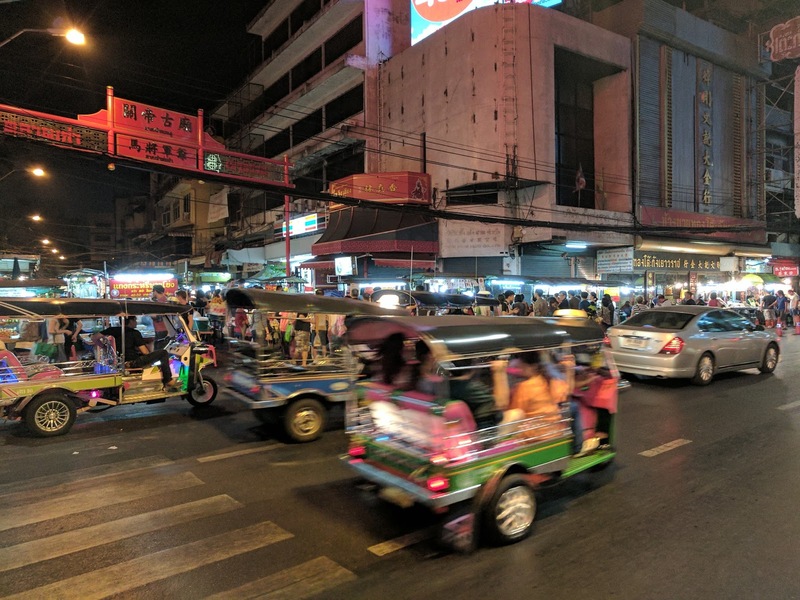 We may be naïve, but Bangkok feels as safe as other places we've lived when it comes to strolling after dark. The only "encounter" we had on our way back was with a giant Chinatown rat skittering across our path in a construction detour through some scaffolding. Far away from the food stands, but clearly well fed. We'll try not to post photos every time we eat while traveling in Asia, but it will take some restraint on our parts. Barefoot in Thailand: Footloose and Fancy-free!